Thin and crispy, the dough for this pizza should be just that. And, despite the fact that it seems to be obvious, in fact, to cope with the task of mixing the right test is difficult. Although it is sufficient just to consider some nuances to get the perfect pizza base. The pizza base is half of the success of this dish. After all, it must necessarily be practically invisible, but present a major connecting element. To make the same product, which is prepared in pizzerias, we need to give the process of making thin dough much attention. Pizza dough can be kneaded by leaps and bounds, and without them. However, there is a basic rule which must be adhered to strictly, the dough should be carefully mixed. Alternatively, you can use a bread machine for kneading. Remember that the better and harder you knead the dough, the more it can roll and re-stir, the finer and thinner it will be. Pizza dough is often made from two types of flour – wheat and rye. So it turns out less sweet and more interesting taste. Recipes perfect pizza dough quite a lot. Each family thus has its own secret. To begin with put a light dough. Pour a glass of warm water, yeast, rye flour, a little wheat and salt. Let stand for 30 minutes, when the mixture begins to foam, add the remaining products and begin kneading the dough. As a result of batch, you should get tight but elastic ball of dough. This amount is enough to cook two pizzas with a diameter of 25 cm. Divide the dough into two balls and give him some time for at least 15 minutes. Then roll out two plates and gently pierce them with a fork in several places that the dough did not rise. Let stand so still 10 minutes and only then put the filling. Alternatively, it is possible to prepare such a blank without yeast. Then mix all the products immediately, without preparation of sourdough. This dough is suitable for those who are watching a figure, because despite the presence of wheat flour, it will still be not too sweet. - salt and sugar to taste. To make the dough more tender before adding flour to the dough, be sure to sift it - so it will be filled with oxygen. Heat the milk to room temperature and place the yeast, sugar and salt. Then add the already beaten egg, vegetable oil, flour and all mix well. The dough should be smooth and elastic, and well behind the hands. Place it in a bag and put it in the fridge, so it's a little rasstalas. Soak it there for about an hour. Then roll out the dough, grease a baking sheet or form with vegetable oil and place the dough. 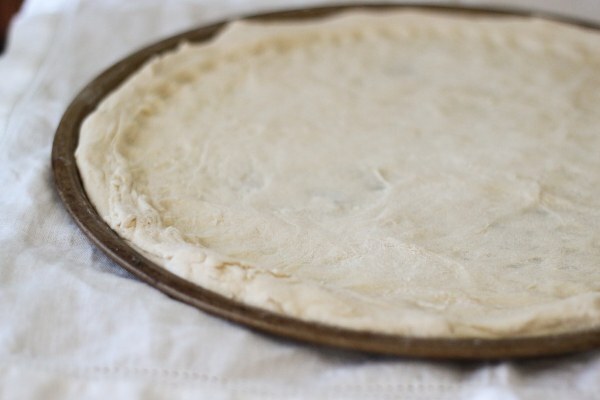 Immediately put on him the filling, that it didn't rise (it cannot be kept long in the heat) and bake.